Paul Weller Reportedly Got Married In Italy Last Week! – Paul Weller News! 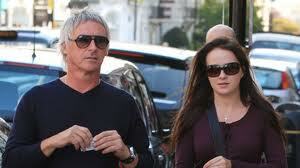 Paul Weller Reportedly Got Married In Italy Last Week! 2 Comments on Paul Weller Reportedly Got Married In Italy Last Week! Congratulations to Paul Weller, who is reported to have married girlfriend Hannah Andrews during a low-key ceremony in Capri, Italy, last week. The Modfather got engaged to Andrews, nearly 30 years younger than him, in April this year, as reported in Spinner. The couple tied the knot in a low-key gathering with just a handful of guests, The Sun reported. A backing singer, Andrews performed on Weller’s 2008 album ’22 Dreams’ and his subsequent tour. His previous relationship, with partner Samantha Stock, ended just before Christmas 2008. Last month, Weller told The Sunday Times that he did not feel he had to defend the age gap. Previous Entry New Paul Weller DVD/CD Combo To Be Released November 29! Next Entry Paul Weller Was A Surprise Guest At Robert Kirby Memorial Concert!